His Grace, Bishop Michael visited Holy Spirit Church in Wantage NJ on Wednesday evening, 12 March 2014, to celebrate the Liturgy of the Holy Pre-Sanctified Gifts. Faithful from the parish and Archpriest Samuel Kedala (rector) greeted visitors from other churches in attendance. A Lenten meal was served in the church hall after the celebration of a spiritually uplifting experience during the second week of our Lenten journey to PASCHA. 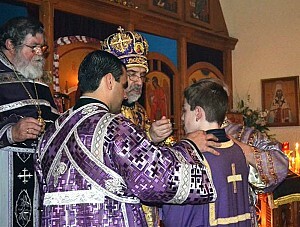 Serving with Bishop Michael were Father Samuel Kedala and members of the Three Hierarch's Clergy Association: Father Christos Talleos (Holy Cross Greek Orthodox Church, Middletown NY and President of the Association), Father John Angel (Saint Nicholas Greek Orthodox Church, Newburgh NY), and Father Iakovos Fitspatrick (Saint George Orthodox Church, Kingston NY). Subdeacon Mark Federoff assisted along with servers from Holy Spirit and Holy Cross Churches. CONGRATULATIONS: Members of Our Diocesan Family!